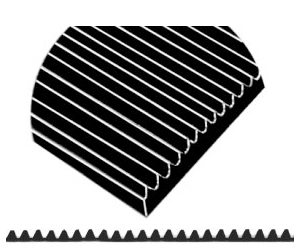 Rugged but light weight this product is specially made for us to provide a deep vee rubberized mat tough enough to stand up to the rigors of prospecting but thin enough to not require special applications. The overall height of the mat is 15/100ths of an inch and the depth of the groove is 11/100ths of an inch. Choose the size of the mat from the drop down menu below.